Summary: A bill before the Baltimore City Council would gradually raise the city’s minimum wage to $15 by mid-2020. It would also ensure tipped workers, such as waiters and bartenders, are eventually paid the full minimum wage, instead of the $3.63 subminimum wage. This proposal would raise wages for 98,000 working people—about 27 percent of all Baltimore workers. Once the minimum wage reaches $15, the average affected worker would earn roughly $4,400 more each year than she does today. Far from the stereotype of low-wage workers being teenagers working to earn spending money, those who would benefit are overwhelmingly adult workers, most of whom come from families of modest means, and many of whom are supporting families of their own. Over the last four decades, typical Americans’ pay has stagnated—even though American workers are more productive and the economy has expanded. While low- and middle-income Americans are treading water, an enormous and rising share of income growth goes to corporate profits and the top 1 percent. The reason America’s prosperity in recent decades hasn’t benefited the vast majority is because those with the most wealth and power have enacted policies that exacerbate inequality. We can counter these efforts with policies—such as raising the minimum wage—that help ensure America’s prosperity is broadly shared. The minimum wage is intended to ensure that work provides the means to a decent standard of living. For decades following the enactment of the federal minimum wage in 1938, Congress regularly raised the minimum wage to account for increasing costs of living. The minimum wage hit its peak value in 1968, when it equaled $9.54 in 2015 dollars.1 Since then, the real (inflation-adjusted) value of the minimum wage has declined, as increases have been too infrequent and too modest to keep up with rising prices. As a result, today any parent working full time who earns the federal minimum wage ($7.25) is paid too little to escape poverty. In lieu of federal action on the minimum wage, many states and localities have elevated their own minimum wages above the federal minimum. Some of these measures have also raised the subminimum wage paid to tipped workers (such as waiters and bartenders), which at the federal level has remained at $2.13 since 1991. This report analyzes the likely impacts of the proposed Baltimore minimum-wage increase on workers and their wages. In addition, the report examines the demographics of affected workers, including their age, gender, race and ethnicity, education levels, work hours, family status, household composition, and family income, as well as the industry in which they work. Raising the Baltimore minimum wage to $15 per hour by mid-2020 would directly or indirectly lift wages for 98,000 workers—about 27 percent of the city’s workforce. Over the course of the minimum-wage increase, affected workers would gain over $430 million in additional wages. The average affected worker would earn roughly $4,400 more in annual pay than she does today (assuming no change in the number of work hours). 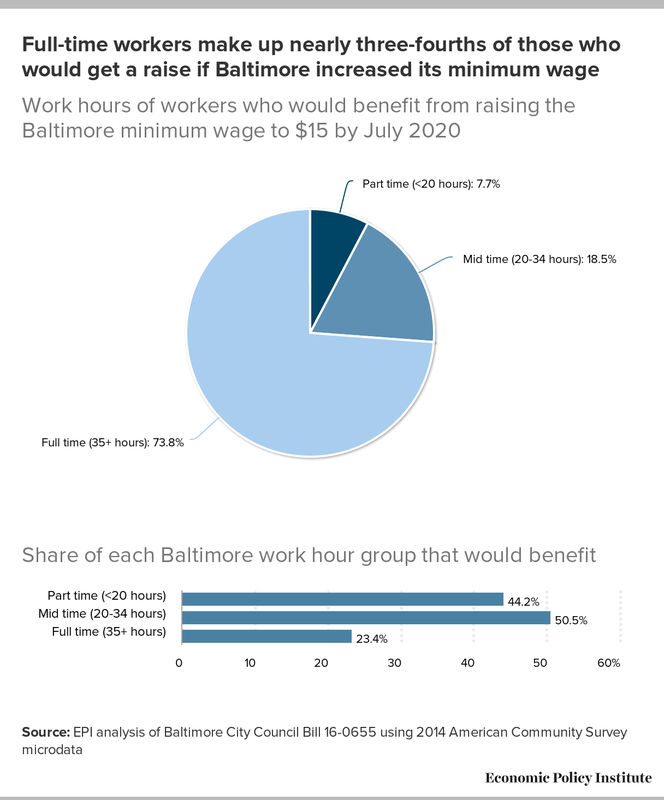 Raising Baltimore’s minimum wage to $15 by 2020 would increase pay for a wide range of workers. Just 4.3 percent of affected workers would be teenagers, while 95.7 percent would be age 20 or older. 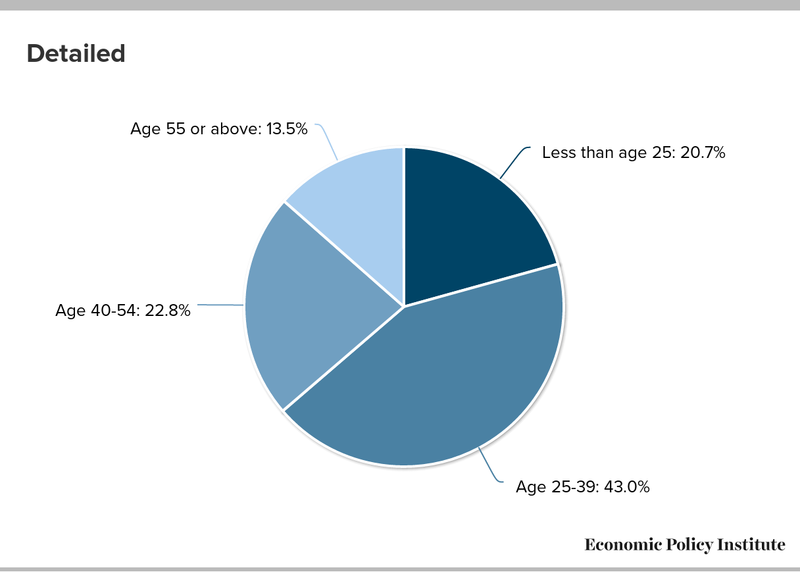 Almost four-fifths of affected workers would be age 25 or older. Women would comprise 55.3 percent of affected workers. The higher minimum wage would particularly benefit working mothers—almost a quarter of working mothers and more than a third of single working mothers would receive a pay increase. People of color comprise the majority of workers who would get a raise: 54.2 percent of affected workers are black or African American, 8.3 percent are Hispanic, and 5.1 percent are Asian. On average, affected workers earn 54.6 percent of their family’s income. Among affected workers with families, just under one-fifth are their family’s sole provider. Workers in lower-income households would disproportionately benefit from the minimum-wage increase. Nearly half of affected workers come from households making less than $50,000 a year, and an additional 17.4 percent come from households making between $50,000 and $75,000 a year. Similarly, nearly two-thirds of Baltimore workers in poverty or near poverty would get a raise under a minimum-wage increase to $15. 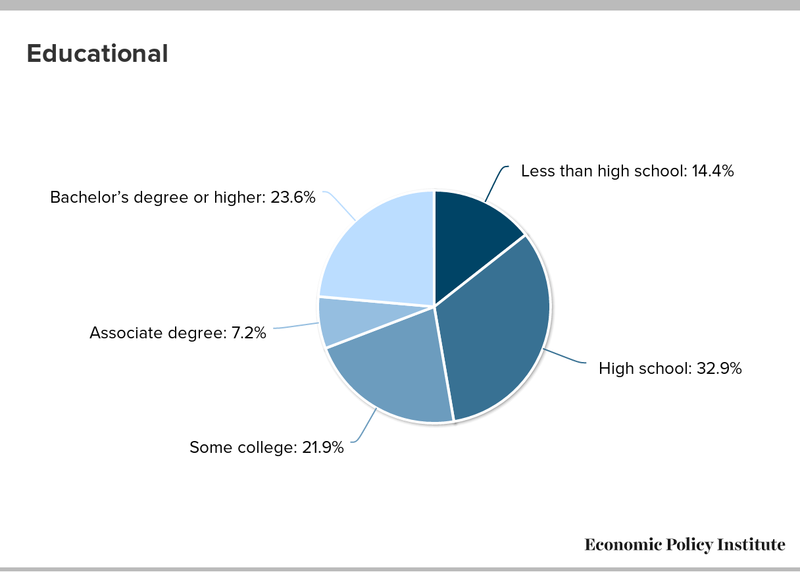 Over half (52.7 percent) of affected workers have at least some college experience, and 23.6 percent have at least a bachelor’s degree. The industries with the largest shares of affected workers are hospitality and retail. Over 60 percent of Baltimore workers in these industries would benefit from the increase. By raising wages for over one-fourth of Baltimore workers, a $15 minimum wage would help many low- and middle-income households make ends meet in one of the country’s more expensive areas. Absent any legislation at the local level, Baltimore will follow the minimum-wage schedule of the state of Maryland. Table 1 shows this schedule versus that proposed by the Baltimore bill, both for the overall minimum wage and the tipped minimum wage. Currently, the overall minimum wage for Maryland is scheduled to rise to $8.75 from $8.25 on January 1, 2017. The statewide minimum wage will escalate to $10.10 by July 1, 2018, while the tipped minimum wage will remain at $3.63.3 The Baltimore bill would raise the city’s minimum wage to $10 from $8.25 starting on January 1, 2017. The minimum wage would then gradually increase to $15 by July 1, 2020. In subsequent years it would automatically increase to keep pace with rising prices. 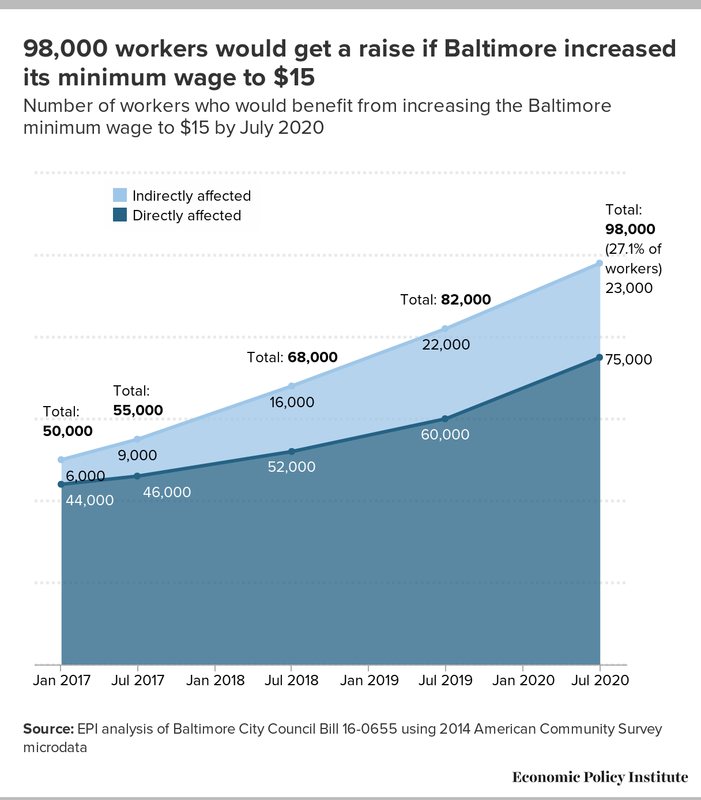 The bill would also gradually increase Baltimore’s tipped minimum wage to $15 by 2024, and would then make it equivalent to the regular minimum wage in 2025. * Baltimore currently follows Maryland's minimum-wage schedule. ** The bill proposes that Baltimore's minimum wage be indexed to changes in prices beginning in 2021. Estimates of future price changes are forecast using inflation projections for the Consumer Price Index in CBO (2016). *** Under the proposal, the tipped minimum wage would equal the regular minimum wage in 2025. One commonly mentioned reason for opposing minimum-wage increases is that many minimum-wage workers are teenagers living with their parents and earning discretionary spending money—and thus the minimum wage isn’t effective at helping those who most need the additional income. 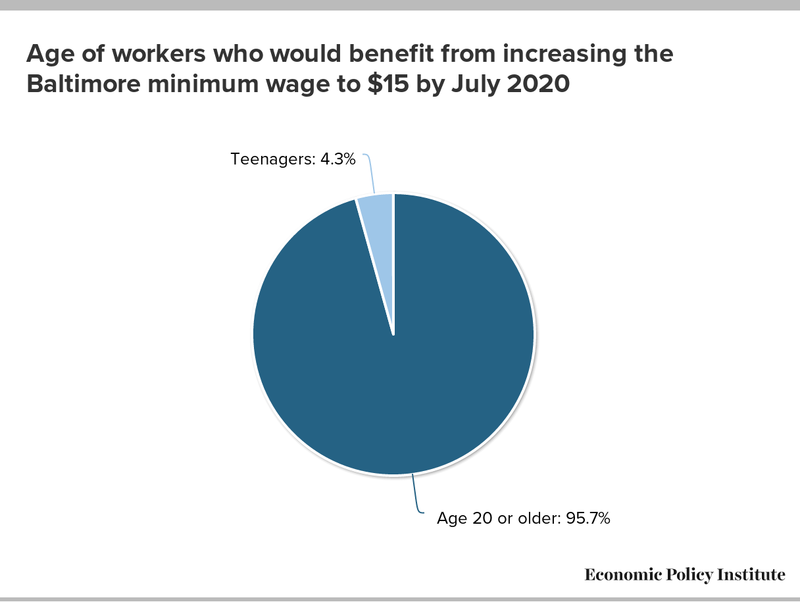 While it is true that teenagers (age 16–19) are disproportionately low-wage workers, they make up a very small share of the workforce that would benefit from a higher minimum wage. As shown in Figure B, teenagers comprise just 4.3 percent of affected workers. Almost 96 percent of affected workers are age 20 or older. 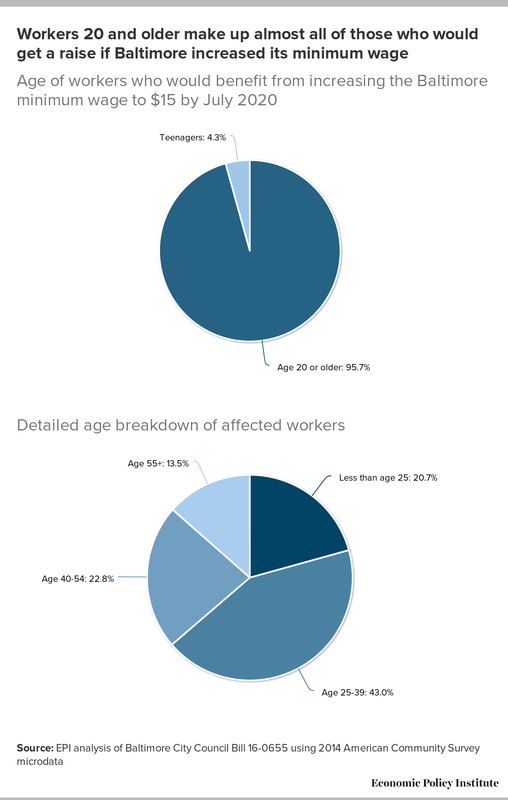 Looking at the more detailed age breakdown in Figure B, about four-fifths of affected workers are age 25 or older. 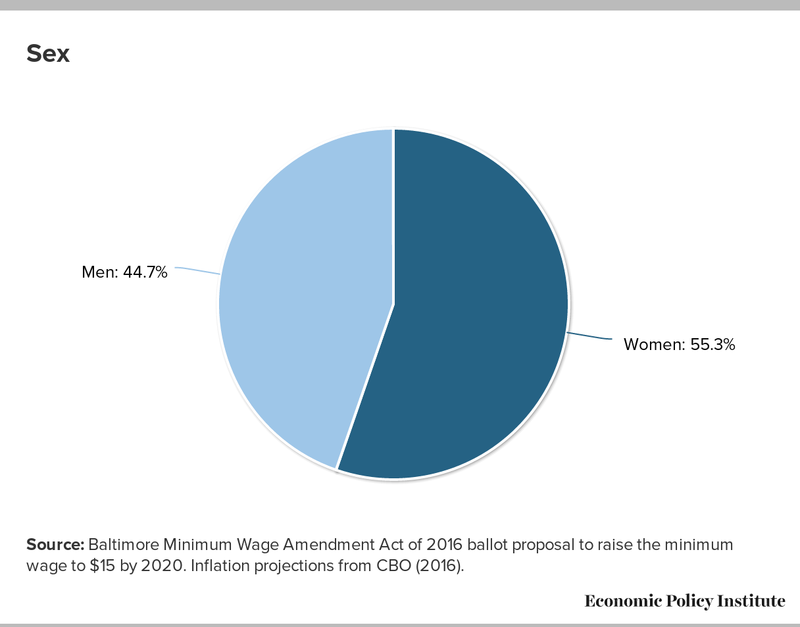 Women outnumber men in the Baltimore workforce (52.5 percent versus 47.5 percent) but would be disproportionately affected by raising the minimum wage to $15, comprising 55.3 percent of affected workers (as depicted in Figure C). 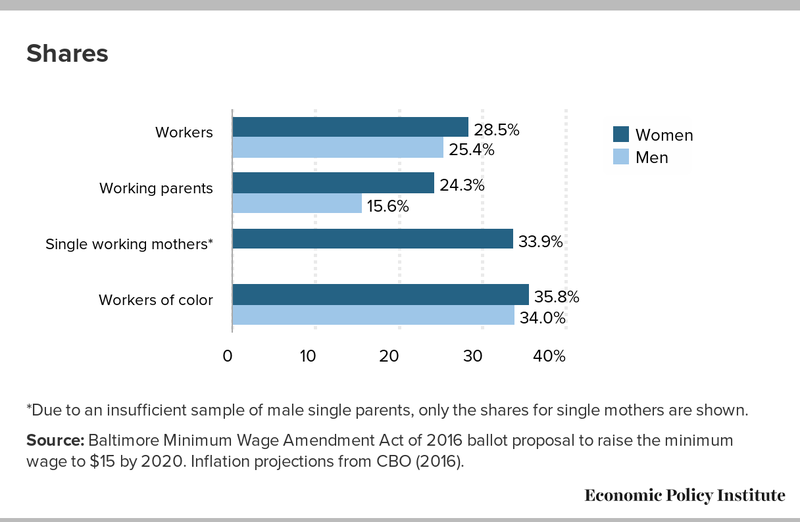 The higher minimum wage would provide a boost to many working mothers—24.3 percent of working mothers and 33.9 percent of single working mothers would receive pay increases. * Due to an insufficient sample of male single parents, only the share for single mothers is shown. 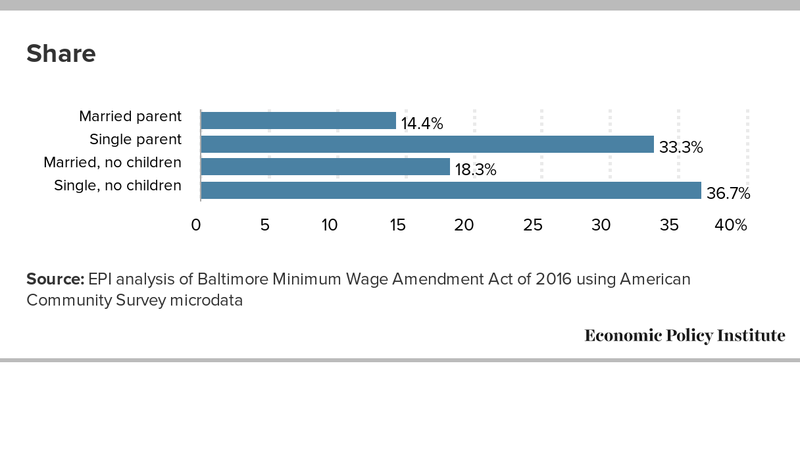 To an even greater extent than women, workers of color would also benefit disproportionately from a $15 Baltimore minimum wage. 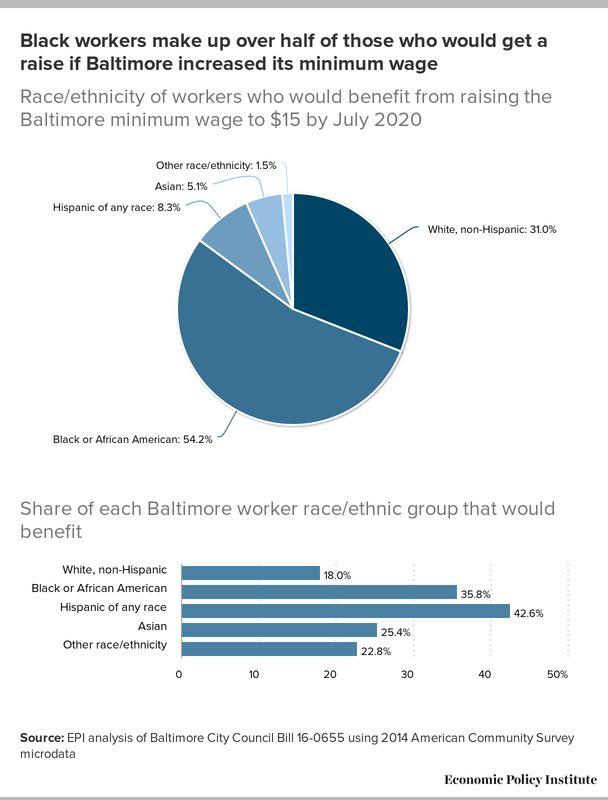 Collectively, workers of color make up 69.0 percent of those affected by the minimum-wage hike, despite constituting only 53.4 percent of the Baltimore workforce. 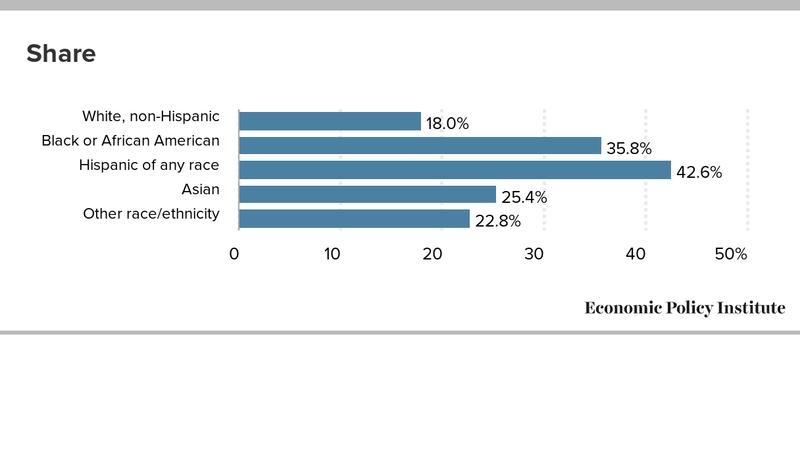 While non-Hispanic whites slightly outnumber blacks or African Americans in the Baltimore workforce, black workers would comprise the majority (54.2 percent) of those affected by the increase, as shown in Figure D. The bottom half of Figure D also demonstrates the share of Baltimore workers within each race/ethnicity who would be affected. Hispanic workers are the most likely to be affected, with 42.6 percent benefiting from the increase. 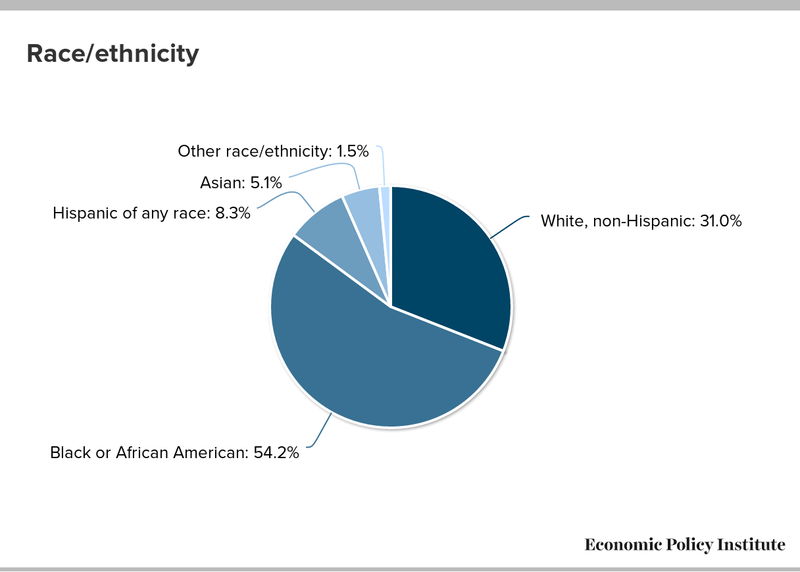 Over one-third (35.8 percent) of black or African American workers would benefit, compared with about a quarter of Asian workers and less than a fifth of white workers. Figure E highlights another underappreciated fact about low-wage workers: Many have higher levels of education than is commonly thought. The majority (52.8 percent) of workers who would benefit from the Baltimore minimum-wage bill have at least some college experience, with 29.2 percent having some college experience or an associate degree, and 23.6 percent having a bachelor’s degree or higher. This is consistent with research showing that college-educated workers are increasingly competing for lower-paying jobs that have typically been filled by those with less than a college education (Abel, Deitz, and Su 2014). In fact, recent college graduates earn less now than in the early 2000s (Kroeger, Cooke, and Gould 2016). As a consequence, minimum-wage policy is much more relevant for workers with higher levels of education today than in the past. However, those with less education are still more likely to be low-wage workers and thus be affected by the higher minimum wage, as the bar graph in Figure E shows. Slightly over half of workers with less than a high school degree would be affected by the minimum-wage increase, whereas just 14.5 percent of workers with a bachelor’s degree or more would be impacted. Between those two groups, 37.1 percent of workers with a high school degree would receive a pay increase, as would 33.4 percent of workers with some college experience and 29.0 percent of workers with an associate degree. Taken together, these results show that while a higher minimum wage would disproportionately benefit those with less education, workers at all education levels would be affected. In the same vein as the stereotype of minimum-wage workers mainly being teenagers, it is presumed that most low-wage workers are just earning discretionary spending money from part-time work. But as Figure F shows, the vast majority (73.8 percent) of Baltimore workers who would benefit from a $15 minimum wage work full time (at least 35 hours per week). An additional 18.5 percent of affected workers work between 20 and 34 hours each week, while only 7.7 percent work less than 20 hours per week. 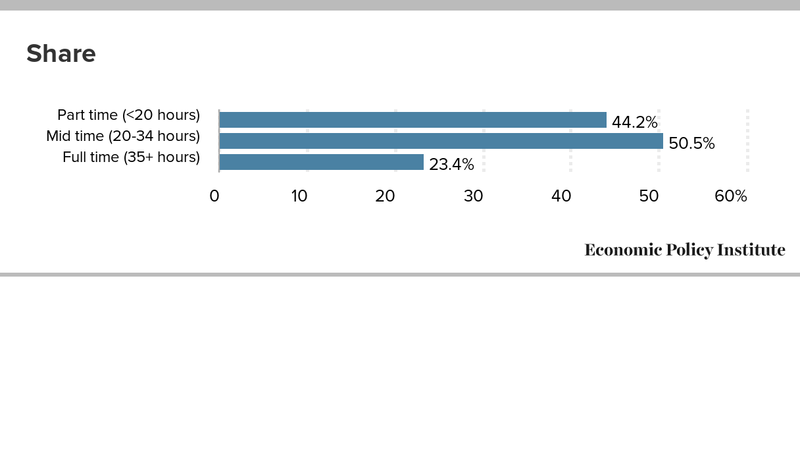 The bar chart in Figure F shows that within those work-hour groups, 44.2 percent of part-time workers would receive a pay increase from the minimum-wage hike, versus 50.5 percent of those working 20–34 hours and 23.4 percent of full-time workers. Raising the minimum wage can actually help enable part-time and mid-time workers to transition to full-time work. Cognizant of the high costs of child care (Maryland ranks fifth nationwide in terms of child care expenses), parents might choose to work fewer hours so they can care for their children (Gould and Cooke 2015). A $15 Baltimore minimum wage might allow some parents to afford child care and dedicate more time to their jobs. In other circumstances where individuals have to work multiple jobs to make ends meet, the raise they receive from the increased minimum wage might allow them to reduce their hours or work only one job. An increased minimum wage therefore provides minimum-wage workers with greater flexibility in balancing work hours and family needs. 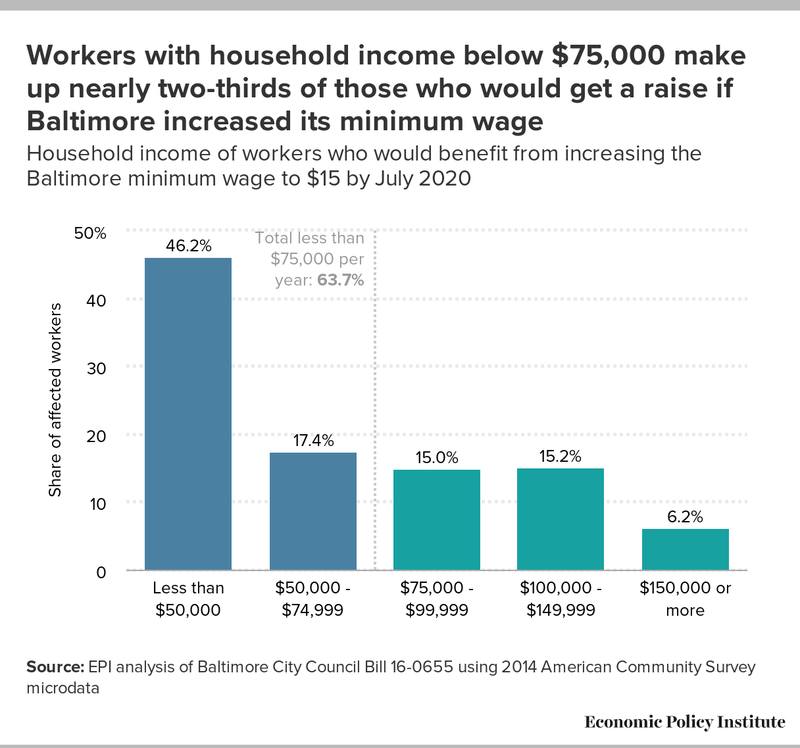 The majority of Baltimore workers who would benefit from the minimum-wage increase live in households of modest means. As depicted in Figure G, over 63 percent of affected workers are in households earning less than $75,000 a year. About 46 percent of affected workers are from households making less than $50,000 per year, while 15.0 percent have a household income between $75,000 and $99,999, and 21.4 percent live in households making $100,000 or more per year. That lower-income families would benefit from the $15 minimum wage is particularly important because the Baltimore–Towson metropolitan area has significantly higher costs of living than much of the rest of the country. Typical living expenses are comparable to those in the Los Angeles, Philadelphia, and Seattle metro areas (Gould, Cooke, and Kimball 2015). Accounting for costs of housing, food, transportation, child care, health care, other necessities, and taxes, a single, childless adult working full time would require an hourly wage of at least $16.36 in 2015 (about $34,000 annually) to achieve a modest but adequate living standard (Gould, Cooke, and Kimball 2015).7 The statewide minimum wage of $8.25, which currently applies in Baltimore, thus provides only slightly more than half this amount. If the Baltimore proposal were enacted, the $15 minimum wage would only be reached in 2020. By that point, after accounting for inflation, it would equal $13.48 in 2015 dollars8—which still falls short of the level needed for a single, childless worker to achieve a minimally decent standard of living. Of course, workers with children (who constitute about 57 percent of Baltimore’s workforce) require more than $13.48 per hour to adequately support their families, even if both parents work full time on the minimum wage. For example, a typical two-parent, two-child family would require about $74,500 to achieve a modest but adequate standard of living (Gould, Cooke, and Kimball 2015). 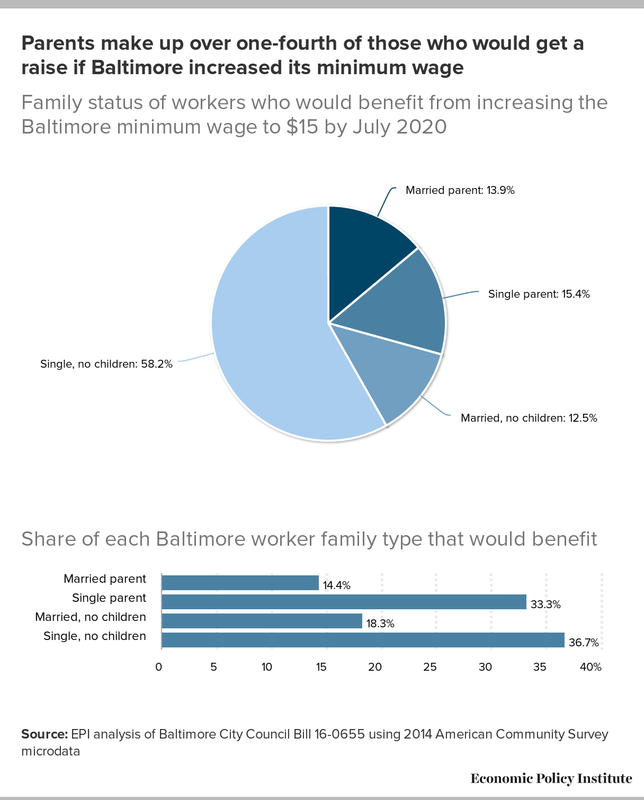 With both parents working full time at the $15 minimum wage in 2020, they would still fall short, at $56,077 (in 2015 dollars)—but would be earning approximately 63 percent more than at the current minimum wage.9 The Baltimore $15 minimum wage would thus provide a substantial boost to the city’s lowest-income households. This is also evident when looking at the proposal’s effects on families in or near poverty. 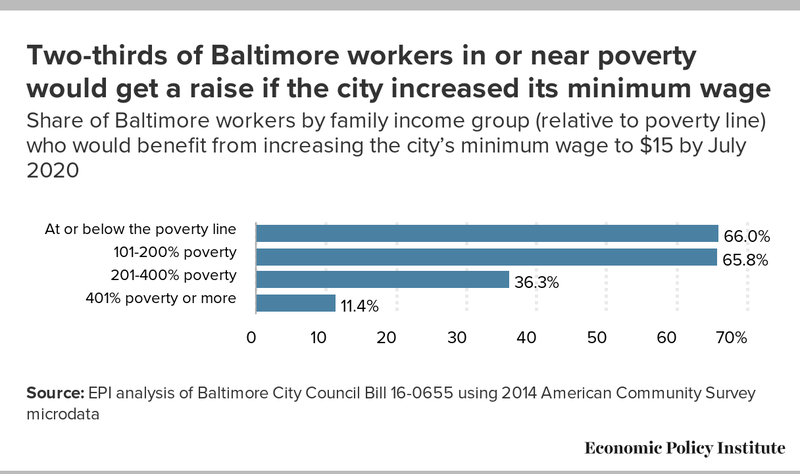 Figure H shows that among Baltimore workers with family incomes below twice the poverty threshold, roughly two-thirds would benefit from increasing the minimum wage to $15 by 2020. In comparison, 11.4 percent of workers with family incomes of at least four times the poverty threshold would be affected. 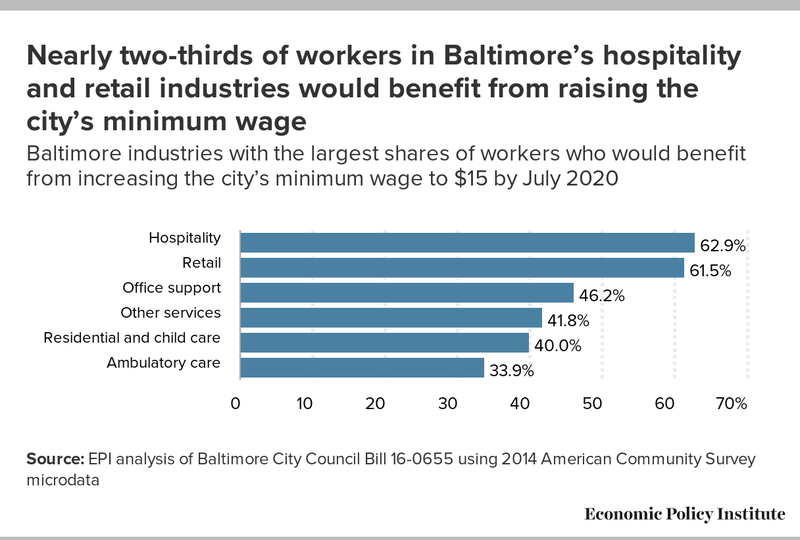 The $15 Baltimore minimum-wage bill would benefit many workers who are their family’s primary provider, or who are responsible for a large portion of their family’s income. On average, affected workers earn 54.6 percent of their family’s total income. Among affected workers with families, just under one-fifth are their family’s sole provider. A $15 Baltimore minimum wage would benefit hundreds of thousands of children. About 29.3 percent of affected workers have children, as shown in Figure I. 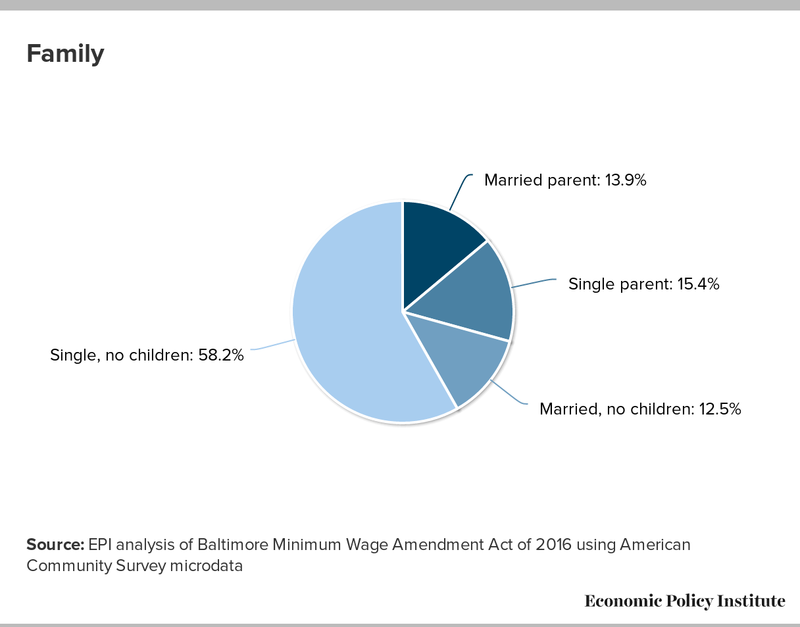 As a result, about 329,000 children (27.6 percent of all children with a parent working in Baltimore) would have at least one parent affected by the higher minimum wage. The bar chart in Figure I shows that a $15 minimum wage is an especially potent tool for raising the wages of working single parents, one-third of whom would see their pay increase. Workers in low-wage industries are disproportionately likely to be affected by a $15 Baltimore minimum wage. Figure J shows that the two industries with the highest concentration of affected workers are hospitality (accommodation and restaurants) and retail—two industries that tend to pay lower wages. Close behind, however, are several industries in which it might be surprising to find significant shares of workers paid close to the minimum wage: office support (including administrative and waste management services), other services (such as advocacy organizations, repair services, and personal services), residential and child day care (shortened from residential care, social assistance, and child day care services), and ambulatory care. In short, it is important to realize that low-wage workers play a vital role in the economy. In particular, Gould (2015) analyzed child care workers’ earnings and found that a majority of these workers could not reasonably afford child care for their own children. Like many other recent minimum-wage proposals, the Baltimore bill would ensure that tipped workers eventually receive the same wage protections guaranteed to all other workers. By law, tipped minimum-wage workers are entitled to receive the regular minimum wage through the combination of their tips and their hourly base rate (which currently stands at $3.63 in Maryland). However, this requirement is exceptionally difficult to enforce, and there is evidence of considerable abuse. In investigations of over 9,000 restaurants from 2010 to 2012, the Department of Labor’s Wage and Hour Division—the agency responsible for regulating and enforcing the provisions of the Fair Labor Standards Act (FLSA), including the minimum wage—found that about 84 percent of investigated restaurants were in violation of the FLSA, including millions of dollars’ worth of tipped minimum-wage violations. Such high incidence of wage theft, and the earnings instability caused by relying primarily on tips, results in tipped workers being more than twice as likely to be in poverty as non-tipped workers (Cooper 2013). Opponents of raising the tipped minimum wage claim that doing so would have detrimental effects on consumers and restaurants, yet these claims are questionable. There is no subminimum wage for tipped workers in Alaska, California, Hawaii, Minnesota, Montana, Nevada, Oregon, and Washington. Notably, between 1995 and 2014 these states experienced slightly faster employment growth in the hospitality industry (the industry with the highest concentration of tipped workers) than the states where tipped workers are paid a lower minimum wage (Allegretto and Cooper 2014). Allegretto (2013) similarly found little evidence that increases in the tipped minimum wage had any effect on employment in either full- or limited-service restaurants. There is also no evidence that service quality is systematically any different in the eight states where tipped workers receive the regular minimum wage than in the rest of the country. Indeed, tips and service quality are only weakly correlated (Lynn and McCall 2000). Factors outside the control of the tipped worker, such as their race and gender, have been shown to be more significant in affecting tip amounts (Brewster and Lynn 2014). This highlights the need to ensure all tipped workers receive an adequate base wage that is not susceptible to the whims of the consumer. Boosting Baltimore’s tipped minimum wage—and eventually replacing it with the full minimum wage—would disproportionately increase the pay of tipped workers who are women and people of color. Crucially, these workers’ pay would also be more stable and predictable, allowing them to budget and plan more effectively. The experience of states with higher tipped minimum wages, and of states where tipped workers receive the full minimum wage, indicates that a higher tipped minimum wage would not pose a major obstacle for industries that employ tipped workers. A $15 minimum wage in Baltimore would give a much-needed pay increase to 98,000 workers, providing the average affected worker with roughly $4,400 in additional annual pay. These impacts would disproportionately affect women and, to a greater extent, people of color. Additionally, the $15 minimum wage would result in much-needed pay increases for workers from low- and middle-income households. Beyond improving the living standards of affected workers, such an increase would also strengthen consumer demand in the local economy, as these workers are very likely to spend any extra income. Importantly, the bill follows in the steps of other recent minimum-wage increases by effectively eliminating the subminimum wage for tipped workers. Having a lower tipped minimum wage creates greater income instability for tipped workers, which makes them more likely to be in poverty. Given strong evidence showing that eliminating the tipped minimum wage does not hamper employment growth in tipped-based industries, this change is long past due. In short, raising the minimum wage would help ensure the economy works for all Baltimore workers. For a detailed explanation of the methodology used in this report, see Appendix B in Cooper (2016). — The author thanks David Cooper, Tanyell Cooke, and Michael McCarthy for their invaluable help producing this report. As analyst for EPI’s Economic Analysis and Research Network (EARN), Will Kimball researches state-level issues such as the minimum wage, state labor markets, poverty, and wage and income trends. Will joined EPI in 2013 as a research assistant, supporting EPI’s research on wages, labor markets, macroeconomics, and international trade. Prior to joining EPI, he worked at the Center on Budget and Policy Priorities and the Center for Economic and Policy Research. 1 Total estimated workers is estimated from the American Community Survey respondents who were 16 years old or older, employed, but not self-employed, and for whom a valid hourly wage can be imputed from annual wage earnings, usual hours worked per week, and weeks worked in the previous year. All government workers are excluded, except those who work for "local government," who are presumed to work for the City of Baltimore and are therefore subject to the minimum-wage proposal. 2 Directly affected workers will see their wages rise, as the new minimum-wage rate will exceed their current hourly pay. 3 Indirectly affected workers have a wage rate just above the new minimum wage (between the new minimum wage and 115 percent of the new minimum). They will receive a raise as employer pay scales are adjusted upward to reflect the new minimum wage. 4 Total amount of increased annual wages for directly and indirectly affected workers. Values in each step are cumulative of preceding steps. Note: Some workers indirectly affected in earlier steps will be directly affected in later steps; thus, the step-three demographics describe all workers affected as a result of the increases. Wage increase totals are the sums of all steps, as indicated. Note: Assumed annual working-age population growth is 0.15 percent (2015–2020 annualized labor force growth rate projections from Maryland Department of Planning. Assumed annual nominal wage growth is 2.57 percent from 2014 to 2018 (Maryland average annual wage growth of bottom 20 percent of wage earners from 2013 to 2015, according to CPS ORG). In subsequent steps, wages are assumed to grow at the projected pace of national consumer price inflation, per the Congressional Budget Office Economic Projections (2.39 percent and 2.42 percent in 2019 and 2020, respectively). These increases only reflect the result of the proposed change in the minimum wage of Baltimore. Wage changes resulting from the scheduled changes to the Maryland state minimum-wage law are accounted for in the simulation. 1. Author’s calculations using the CPI-U-RS. 2. See the EPI Minimum Wage Tracker (EPI 2016) and Cooper (2016). 3. Prior to the legislation that increased the regular minimum wage in 2014, Maryland’s tipped minimum wage was set at 50 percent of the regular minimum wage. As of 2014, it is set at the fixed amount of $3.63 per hour, and will no longer automatically go up as the regular minimum wage increases. 4. This includes both workers affected by the standard minimum wage and the tipped minimum wage. 5. 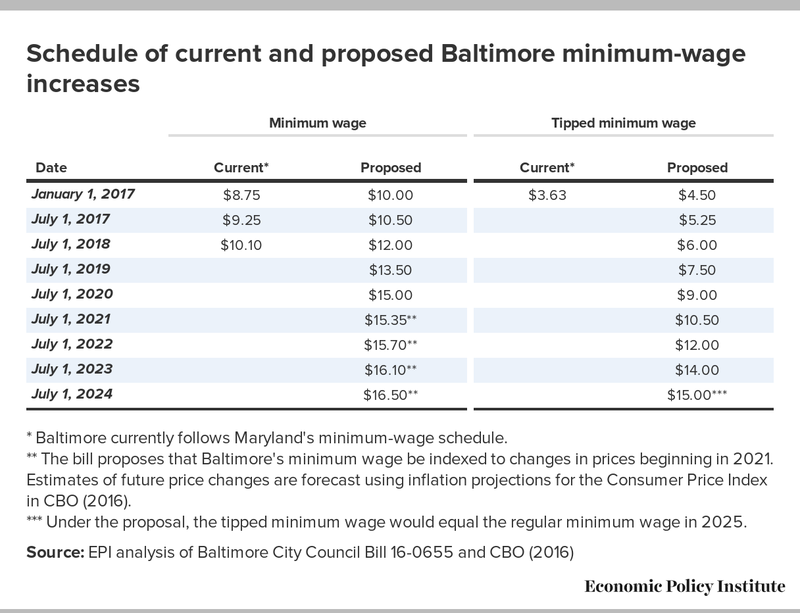 Our model accounts for the wage effects of the rise of the Maryland state minimum wage, then estimates how the increase from $8.75 to $10.00 would affect Baltimore workers. The model includes both tipped and non-tipped workers, with the model reflecting their different minimum-wage schedules. 6. 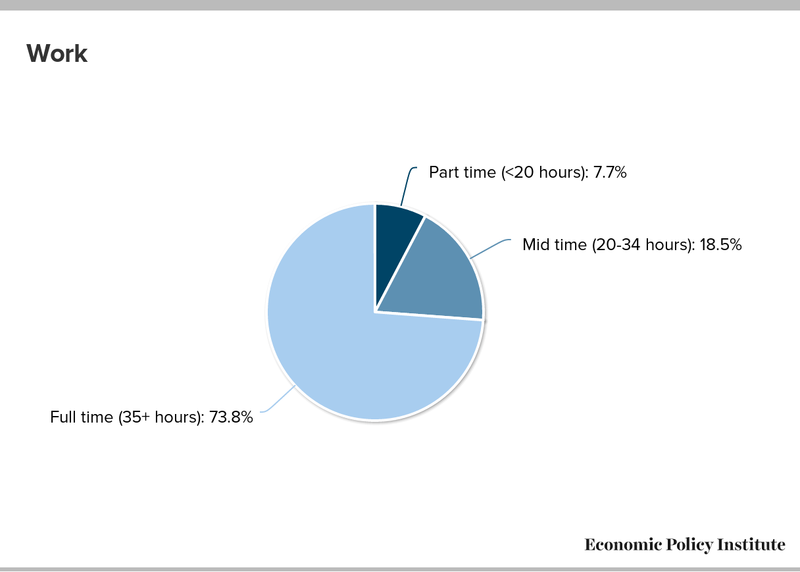 This figure is based on a total estimated workforce defined as those American Community Survey respondents who are 16 years or older, employed but not self-employed, and for whom a valid hourly wage can be imputed from annual wage earnings, usual hours worked per week, and weeks worked in the previous year. All government workers are excluded except those who work for “local government,” who are presumed to work for the City of Baltimore and therefore are subject to the minimum-wage bill. 7. Author’s calculations by inflating the 2014 values in Gould, Cooke, and Kimball (2015) to 2015 dollars using the CPI-U-RS. 8. Author’s calculations using Congressional Budget Office (2016) projections for the CPI, 2016–2020. 9. 2015 value of the proposed minimum wage ($13.48), times two adults working 40-hour weeks all 52 weeks of the year (4,160 hours). 10. Assuming no change in the number of work hours. Abel, Jaison R., Richard Deitz, and Yaqin Su. 2014. 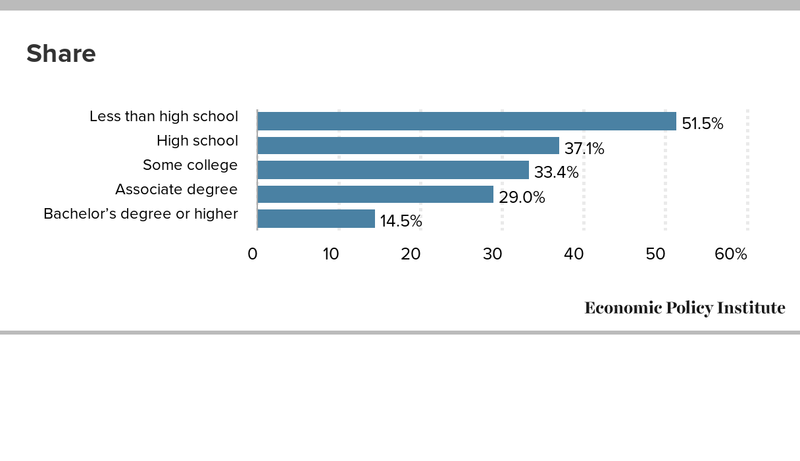 “Are Recent College Graduates Finding Good Jobs?” Federal Reserve Bank of New York’s Current Issues in Economics and Finance, vol. 20, no. 1. Allegretto, Sylvia. 2013. Waiting for Change: Is it Time to Increase the $2.13 Subminimum Wage? IRLE Working Paper No. 155-13. Allegretto, Sylvia, and David Cooper. 2014. Twenty-Three Years and Still Waiting for Change: Why It’s Time to Give Tipped Workers the Regular Minimum Wage. Economic Policy Institute, Briefing Paper #379. Brewster, Zachary, and Michael Lynn. 2014. “Black-White Wage Gap among Restaurant Servers: A Replication, Extension, and Exploration of Consumer Racial Discrimination in Tipping.” Sociological Inquiry, vol. 84, no. 4, 545–569. Congressional Budget Office (CBO). 2016. The Budget and Economic Outlook: 2016 to 2026.
Cooper, David. 2013. “DC Minimum Wage Part 2: Tipped Minimum Wage—Separate, But Not Equal.” Working Economics (Economic Policy Institute blog), October 31.
Cooper, David. 2016. Raising the New York State Minimum Wage to $15 by July 2021 Would Lift Wages for 3.2 Million Workers. Economic Policy Institute, Briefing Paper #416. Economic Policy Institute (EPI). 2016. Minimum Wage Tracker. Updated April 22. Gould, Elise, Tanyell Cooke, and Will Kimball. 2015. “Family Budget Calculator.” Economic Policy Institute. Kroeger, Teresa, Tanyell Cooke, and Elise Gould. 2016. The Class of 2016: The Labor Market Is Still Far from Ideal for Young Graduates. Economic Policy Institute Report. Lynn, Michael, and Michael McCall. 2000. “Gratitude and Gratuity: A Meta-Analysis of Research on the Service-Tipping Relationship.” Journal of Socio-Economics, vol. 29, 203–214. U.S. Census Bureau. 2014. American Community Survey. Wicks-Lim, Jeannette. 2006. Mandated Wage Floors and the Wage Structure: New Estimates of the Ripple Effects of Minimum Wage Laws. Political Economy Research Institute at the University of Massachusetts Amherst, Working Paper Number 116.